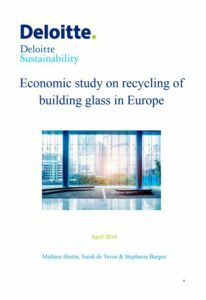 management and recycling of end-of-life building glass in the EU. This study, commissioned by Glass for Europe, is the first of its kind in terms of depth of analysis on this topic and methodology. It provides useful insight into the realities of a building material whose recycling potential is not yet fully utilised. United-Kingdom, also helped identify best practices and pilot projects in the field of building glass waste. In a second part, the study analyses the environmental and economic costs and benefits of different end-of-life routes for building glass waste. It finds that significant environmental benefits can be expected from improved recycling of building glass waste be it in terms of saving carbon emissions, avoiding waste going to landfill and saving virgin raw material. The economic modelling proved however to be more difficult as consultants were faced with a lack of reliable data and the confidential nature of information in this field. Although the study shows some interesting trends, such as the generally higher cost of the recycling route compared to landfilling, the differences between light renovation and building demolition, the importance of the proper collection infrastructure at source, the impacts of transport distances and the need for solutions fitting the regional contexts, etc. data and exact results ‘should be considered with care’ according to the consultants themselves.